I’ve been trying, in every way that I can think of, to share my knowledge and love of physical therapy with young Vietnamese therapists since I first started volunteering in Da Nang more than five years ago. Regretfully, neither I nor any of the other American, Canadian, German, Australian, or New Zealander therapists that I’ve encountered have had any significant success in that regard. Even with our best efforts at demonstrating and explaining, with the assistance of the best translators that we can find, we still have not been able to light a fire under these marginally trained so-called physical therapists. What a pity. And what a puzzle, as well. 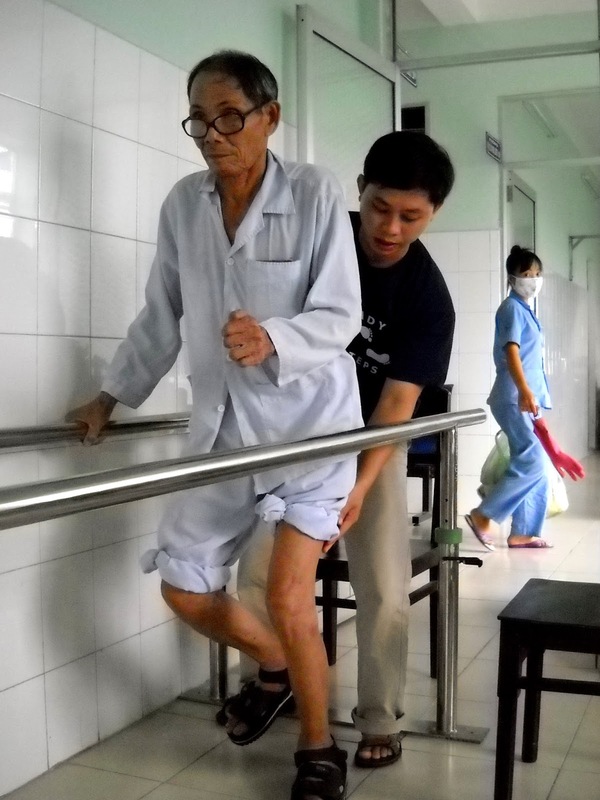 The question I’ve been wrestling with for the past year or so is: what can I do in the face of this seemingly intractable obstacle to providing decent rehabilitative care for the disabled folks that I encounter here in Central Vietnam? The answer that I finally settled upon is to just provide the care myself, with the help of some intelligent, compassionate, bi-lingual young assistants. 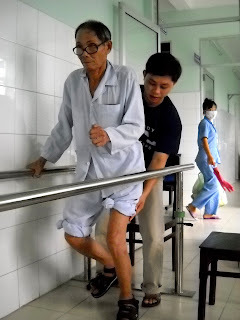 When Tao showed up at the rehab hospital where I was volunteering last year, he told me that he fell down frequently because of weakness in his legs. From the doctors, I found out that Tao had an inoperable, but slow growing, spinal cord tumor in his neck. Upon examination, I determined that Tao’s legs were actually quite strong. His problem was that he could not feel them. That’s why he often tripped and fell and it was also why Tao was unable to travel by motorbike as nearly all of us do in Vietnam. Not only could Tao not control a standard motorbike, he was even afraid to ride on the back as he feared that his feet would slip off the pegs and get caught in the rear wheel. With that insight into Tao’s situation, I worked with him on developing a safe and consistent gait pattern while cautioning him that he would always have to pay close attention to his feet, especially when walking on uneven surfaces. I also bought him a pair of shoes with clearly defined heels and had him practice keeping his feet on the pedals of a stationary bicycle. As a result, Tao was finally able to travel on the back of a motorbike with confidence and so was able to travel home on the weekends to be with his wife and three daughters. Months later, I encountered Tao as he was vigorously pumping a hand-powered cart up a blazing hot, steep stretch of road in the countryside southwest of Da Nang. I cringed to watch him, covered in sweat and with veins bulging on his forehead, struggle up that hill. I knew that the spinal cord tumor in his neck not only blocked sensation to his legs, but it also caused unremitting pain in Tao’s right arm. Tao’s Herculean effort was surely exacerbating his arm pain. The sort of cart that Tao was using is actually rather brilliantly designed. It needs no fuel and moves as fast as a bicycle on level pavement. In fact, Steady Footsteps has purchased quite a few of them for impoverished disabled folks in the Nui Thanh district of Quang Nam province. Unfortunately, Tao lives in an exceptionally hilly area and was trying to eke out a living by selling newspapers and lottery tickets at various coffee and noodle shops in that hilly region. Things were not going well for him—he was racked by pain and he often did not even break even financially on his daily newspaper sales. We followed Tao to his home that day and listened to him talk about his dream of having a little shop of his own. And we made that happen: Steady Footsteps not only supplied Tao with initial merchandise and start-up funds, we also provided him with a used three-wheel motor bike and lessons in how to drive it. Tao’s life is still no bed of roses—his arm still gives him fits and he’s nowhere close to middle-class—but he’s got the shop of his dreams and he’s able to provide for his family and that’s not bad. We finally got the phone call we’d been anticipating for more than a year and a half. Dung’s wife Linh has been admitted to the General Hospital of Da Nang, having at last reconciled herself to the idea of having a tube surgically placed through the wall of her abdomen to prepare for a life-long regime of peritoneal dialysis in the hope that she will be able to continue to raise her two young sons and care for her husband Dung. 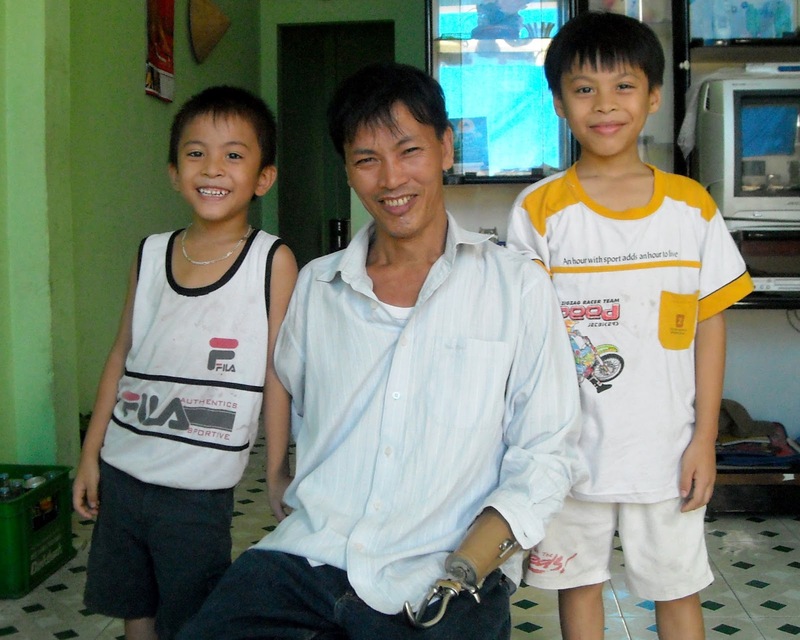 I met Dung and Linh in 2008 at a rehab facility near my home in Da Nang. There, amidst all the stroke and brain-injured patients, Dung was a rarity. He was entirely coherent and independently ambulatory. He had recently survived electrocution on a construction job and had only one major handicap, but it was a big one. We do have a shop in Da Nang that makes artificial limbs. 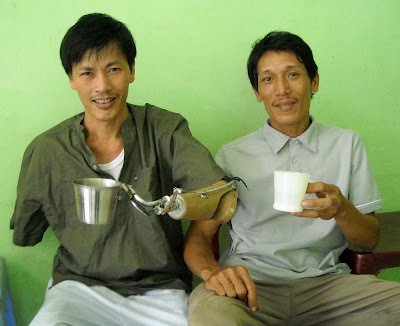 It’s actually pretty darned good when it comes to making practical low-cost artificial legs--in large measure because of the work done here during the Vietnam/American War by the American Friends Service Committee, a Quaker organization. Unfortunately, no one in Da Nang—or in Hanoi, for that matter—had the expertise or the components needed to make a functional arm for Dung. Dung soon left the rehab hospital, realizing that no one there was in a position to help him, but we stayed in touch. For the next year, I sought an answer to Dung’s dilemma. Finally, the Limb Center of Wellington, New Zealand, came to Dung’s rescue. 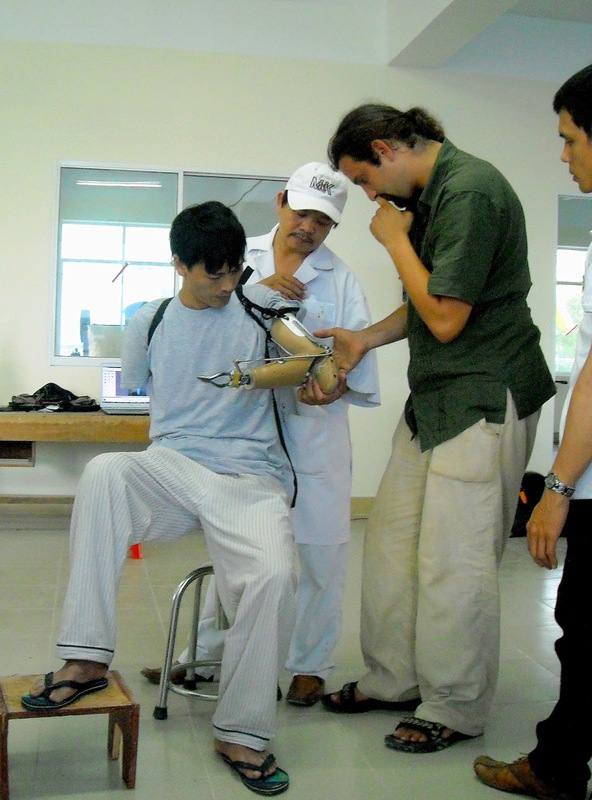 They not only donated the necessary components to compensate for the restricted range of motion in Dung’s left elbow (his right stump is too short to accommodate a functional prosthetic arm), but they also sent a technician, Malte, to help the local prosthetic technicians fabricate this unusual prosthesis. During the following year, Steady Footsteps staff and volunteers worked with Dung to help him become as functionally independent as possible with his new arm. 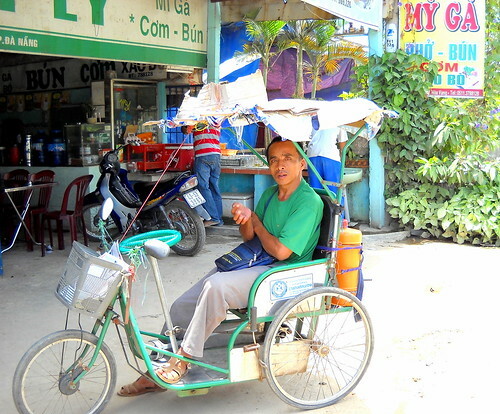 We had a three-wheeled trike designed and fabricated for him so that he could become more mobile. His cousin, who is a welder, designed a cup with a swivel grip made from bullet casings so that he could enjoy drinking coffee with the friends and neighbors who came to the little coffee shop that Dung and Linh opened in the front room of his parents’ house. (Dung’s own house had been demolished in an urban renewal project just before his accident and the compensation money they received was eaten up by medical costs after his accident.) As Dung regained the ability to feed, dress, and bathe himself, he began to pull out the deep depression that had enveloped him ever since his accident. Unfortunately, fate dealt this family yet another cruel blow. 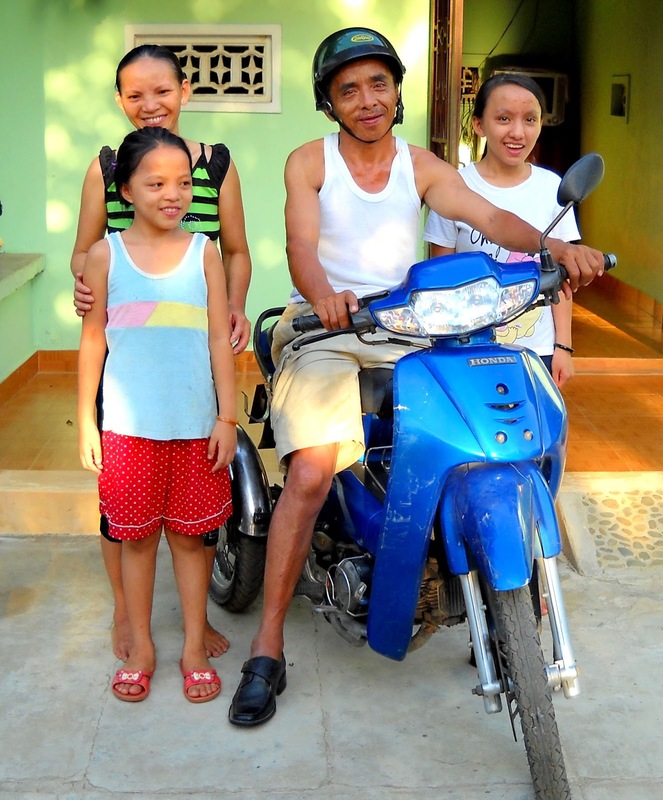 While Dung was learning to operate his new arm, Linh finally sought medical treatment for the severe abdominal pain that she had been suffering. Not surprisingly, considering the stress she had been under, tests showed that she had a duodenal ulcer, for which she subsequently received treatment. The surprising news, however, was that tests inadvertently revealed that Linh had only one kidney. The devastating news was that that one kidney was failing. Linh has been wrestling with that news and its implications for over a year. She’s been hospitalized numerous times since then for palliative treatment and each time the doctors advise her to have surgery and get started on regular dialysis, pointing out that, should she wait until her kidney fails completely, she may very well not survive the surgery. 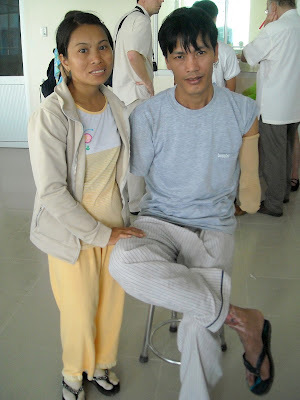 The surgery is more than Linh and Dung can afford, so Steady Footsteps is paying for it. The monthly cost of the dialysis regime is also beyond them and I don’t really see how, in good conscience, we could back away from helping them with that as well. What do you think? Could you help us out with this project? Of all the adaptive devices that we could ever give Dung, what could we do that would ever replace Linh?